Perennial herb of wetlands or moist areas, to 35 cm., glandular hairy throughout; Leaves, mostly basal and few cauline, basal, axils with 5 mm. brown wavy hair, petiole 70 mm. + blade 60 mm. × 12 mm. 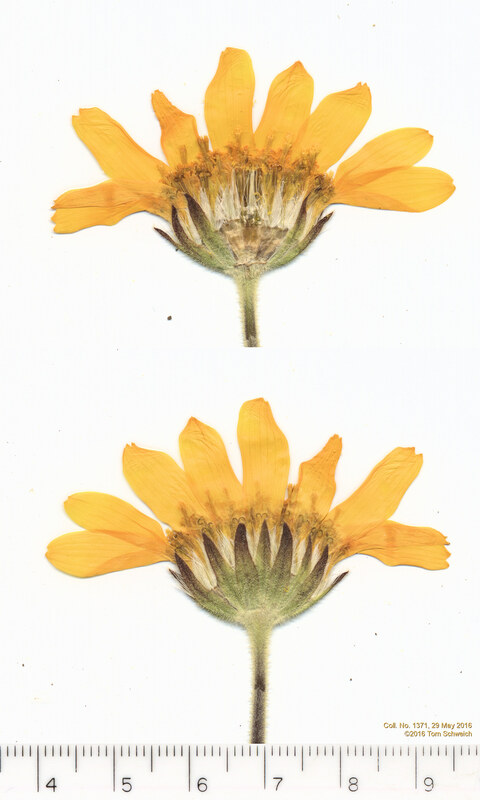 wide, 5 × longer than wide, cauline, opposite, sessile, ±2 pair, much reduced; Inflorescence, single heads on peduncle to 80 mm., flowers of two kinds; Involucre, 13 mm. × 22 mm. wide; Phyllaries, 2 ±equal series, 11-12 mm.× 3 mm. wide, green with dark tips; Receptacle epaleate; Rays, #12, fertile, tube 3 mm. + blade 16 mm. × 7 mm. wide = 19 mm., corolla yellow; Disc flowers, tube 7 mm. + lobes ≤1 mm. = 8 mm. ; Pappus, bristles, 9 mm., white; Anther, yellow; Achene, 5 mm., short hairy. Described from Coll. No. 1119, 28 May 2015, and Coll. No. 1371, 29 May 2016. Subtribe Arnicinae is a subtribe to Madiinae (tarweeds) and Hulseinae, which contains both Hulsea and Eatonella, both common in the Mono Lake basin. Field Notes: Coll. No. 1371, 29 May 2016.